“Discipline creates lifestyle” – Hal Elrod, author of The Miracle Morning. As an entrepreneur, your life can be one of adventure, wealth and passion. Or it can be one of worry, chaos and constant worry. The decision is up to you. And it’s starts with your mindset. The best way to ensure that you always are in the right state of mind to be productive and focused, is to ensure that when your conscious mind turns on, it’s primed for battle. So how do you wake up successful? A morning routine is one of the most important rules to your success in business and in life. Many of us think of routine as boring or a sign of being stagnant. But routine is actually one of the most attractive and lucrative qualities a human being can have. It makes us more efficient and allows us to use more brain power on the pivots that we as business owners have to make every day. In the book Influence, by Robert B. Cialdini, he reveals that routine and consistency is often viewed as having confidence, knowledge, trustworthiness, attractiveness and authority. This makes sense in that unpredictability is a scary thing. When we meet people who are unpredictable, we often put up a level of defense to protect ourselves against their unpredictability. When we go into situations that we know nothing about, our minds go crazy with potential outcomes. When we are faced with decisions for which we don’t know the outcome, we get stressed out. But if we know exactly what’s coming, our minds are free to be more efficient and focus on other tasks or thoughts. If we don’t have to worry about what we are going to eat, or what we are going to wear, or how we are going to start our day, we have more clarity for more difficult decisions, like how we are going to sell $1,000 worth of product. Establishing a morning routine provides a foundation for the rest of your day. So we must make sure that routine gets us ready to conquer the world. Research from the National Institute of Education in Singapore and University of Nottingham performed a meta-analysis of 83 studies on the capacity of self control through ego-depletion and task performance. One of the findings is that the more tasks we are faced with, the more our ability to control our self, our decisions, our impulses, depletes. These findings prove that it is important to achieve the most important goals and face the most important tasks early on in the day, before our brains get inundated with piles of influencers. In auto racing, drivers love to go fast – they have to go fast. But without adequate prep, the right fuel and precise tuning, the car won’t go anywhere. Many workaholics misplace their “most important” list as work-related, and forget that their hard work, can only be completed effectively if your mind and body can support it. 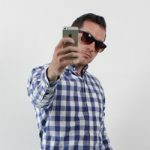 Instead of rolling over and checking your phone for texts, tweets and emails first thing in the morning; your first goal should be to set your brain and your body for the day. It’s like putting your armor on for battle. While I don’t have my entire day mapped out quite as simply as good’ol Ben; my morning is pretty strict. I split my morning up into three categories: physical fitness, mental priming, and nutrition. In my personal experience and because I am in charge of my schedule, waking up naturally gives me the best charge for the day. This means that I try not to set an alarm, I wake up when my body wants to. Sometimes that’s at 6:00am, and sometimes that at 9:00am. Because I train ridiculously hard in crossfit the majority of the week, sometimes I need a ton of sleep and sometimes I don’t. Here is my morning routine which begins as soon as I wake up. There is no right or wrong way to construct a morning routine, except that it has to get you ready for progression. Whether it be progression that day, or week, or month, or year – your routine should help build a solid foundation for progression in your life. The absolute worst thing you can do is wake up to negative thoughts and stress. Now I am no psychologist, but if you have any negative vibes circulating before you go to bed, they are probably going to be the first thing you think of when you wake up. So it’s also important that you have a solid before bed routine. This is also the reason that I refuse to check my phone or email before I complete my morning routine. For instance, a few weeks ago I got an email from a contractor of mine working on a web project. He ran into a major problem that required that we push back the deadline by almost 3 weeks! This was a major issue because the client was already anticipating a prompt launch. If I had checked that email first thing in the morning, my mind would have started going into firefighter mode immediately. I would have forgotten about the rest of my day, I would have grabbed a quick breakfast on the run so I could get right to work, and I probably wouldn’t have done any yoga. But because I didn’t check until I got to the office, I completed my routine, and I was primed to handle the situation. Sure, it threw off the rest of my day, but things like that happen as a business owner, and if I hadn’t primed my mind and body, that battle might have been much harder fought. We stretch first thing when we wake up for a reason. A full body stretch causes a rush of blood throughout our body, delivering much needed oxygen to the sleepy muscles. It causes synapse firing in the nervous system and activates the muscle fibers. This automatic response to an inactive body is natures way of reminding us that our number one priority, is movement. If you want to perform at your best in life, in business, your body needs to drive like a Ferrari, not a rusty 1990 Oldsmobile Cutlass Supreme with an oil leak. Many of the top CEO’s of the largest companies in the world know that fitness is THE priority in their life. 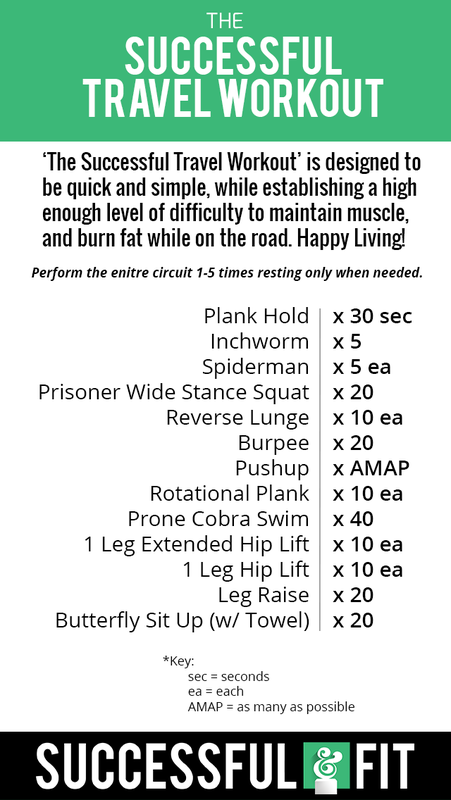 Citigroup CEO, Michael Corbat, crushes the Spartacus Workout like he crushes it in business. Frits van Paaschen, Starwood Hotels CEO, runs 10 miles every day. Aaron Patzer, founder of Mint.com lifts, runs and rock climbs to stay sharp. The list goes on and on. Don’t wait until you get to the office. Don’t do it. By no means should you get in your business before you get to the office, but make sure you work on it. Get your mind wrapped around what you need to get done throughout the day in order to progress your business. The key is to not only write out your tasks, but to write your goals. Your hopes and dreams for the day. What do you want to gain from your experiences. Your tasks will be there when you get to work, but your dreams might escape your brain if you don’t realize them first thing in the morning. 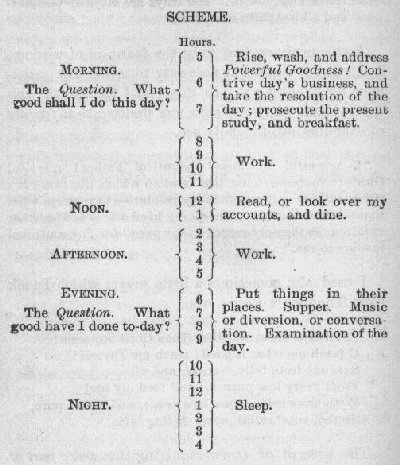 Legendary thinker Ben Franklin used his morning to map out his daily progress. 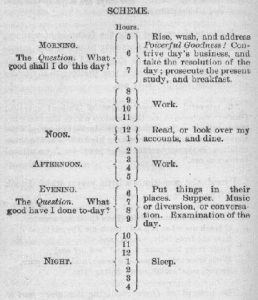 He used it to shape his mind, and map out “What good shall I do today?” (see graphic above). 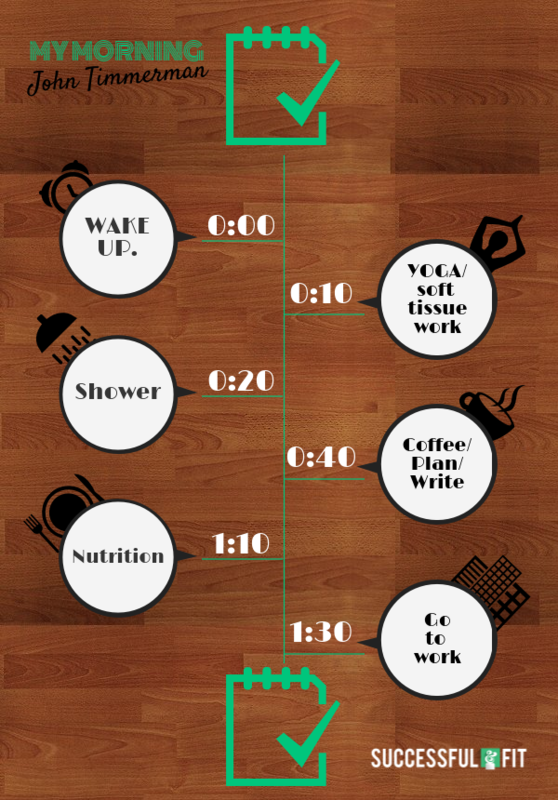 So how do you construct a morning routine? Let’s start with how you wake up. To ensure you wake up rested, the best thing you can do is to wake up on your owns terms, when your brain and body is ready. But with family and schedules, this isn’t always possible. So the next best thing is an app called Sleep Cycle. Sleep Cycle is a phone app that measures your movement in bed and tracks the various sleep cycles that you go through during the night. You set the time that you want to wake up and it begins to gradually wake you with quiet sounds when it detects that you are out of your REM sleep cycle (the deepest sleep). This way you are already on the upswing of waking up. It’s fantastic, I use it every day. Once you wake up, the next most important thing is up to you and your priorities. For me, the next on my list is to prime my body for war. To get ready to conquer the tough day ahead of me. Because I train hard in the gym, my body (and my brain) like yoga to get back in the saddle. Research from the Journal of Physical Activity and Health shows that 20 minutes of yoga can literally make you smarter. If you don’t like yoga, and you want to get in a killer workout, try the following travel routine to get the heart thumping. And if you don’t have the time to fit in a full workout, a quick set of push ups is better than nothing. So drop and give yourself, and your life, twenty. Don’t get hung up on what you do if you are rushed in the morning, just do it. If you only have 5 minutes, bang out 20-30 pushups and stretch your hamstrings. If you only have 2 minutes, do 20-30 Prisoner Stance Squat’s. After I quickly review my goals, I then plan my day with tasks that reinforce those goals. If there are things that might not align with those goals, I figure out how to delegate them or how to get them done efficiently. I also use this time to mentally prepare for anything that might go wrong and how I might handle it. For instance, will I lose a client today? Do we have any deadlines – will we miss it? Could I get injured at Crossfit? How will I get past these roadblocks? A study by the University of California found that students that mentally simulated either the process for doing well on their exam (good study habits) or simulated a desired outcome (getting a good grade) got better grades. For years, elite athletes and sports psychologists have been using mental preparation techniques to improve athletic performance in high-stress situations. Using these same techniques of visualization can help you perform at your best and overcome the obstacles that knock most people down. And it’s not rocket science either. By simply identifying what appointments and tasks you will encounter during the day, then imagining what would make them a success or a failure, you can mentally prepare yourself to handle either situation. When done regularly, this will help to train your brain to spend less willpower dealing with adversity, and more willpower on your own progression. The nutrients you put in your body can literally make or break your success. Now, we all know that eating healthy is important for peak performance, whether it be in athletics, or in business, but why do we still make terrible eating choices throughout the day? As a former weight loss coach, the single greatest determinant of whether a person consistently ate healthy or not, was whether they planned their meals. Planning out your meals works the same way as planning out your daily appointments and tasks. If you don’t know what you are going eat when your brain tells you you’re hungry, your response is to find the first thing that looks like food and shove it in your mouth. But if you know exactly what – and even better, when – you are going to eat, you spend less willpower deciding between healthy and unhealthy foods. So I suggest you plan what you are going to have for breakfast every evening before you go to bed. Make sure it’s healthy and going to give you energy throughout the day. Also it’s important that you always give yourself enough time to cook and eat your breakfast. So make sure that you block out appropriate time in your wake up routine and try to never compromise your daily fuel! Whether you wake up at 5 A.M. or you roll out of bed at noon, the first thing you need to do is prime your body for a successful day. Because willpower is at it’s peak first thing when you wake up, developing a routine can focus your mental energy on success. It allows you to make this preparation process automatic, and allows you to focus on progression, productivity and growth, instead of what underwear will go with your socks. What did you do this morning to make today successful? Seriously, let me know in the comments below!